Condition: Good. Flattened. Few repairs on verso of small cracks in green coloured areas. Remargined. Verso: blank. 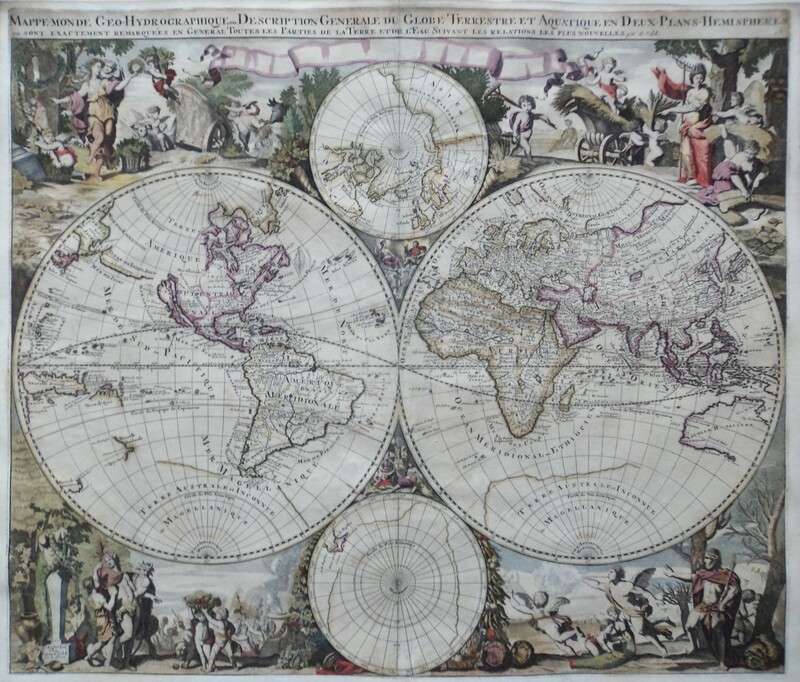 Superb double-hemisphere world map decorated with vignettes representing the four seasons. The cartography appears to be copied from Jaillot's similarly-titled world map published in 1674, although Valck has made the map more lively with the baroque vignettes. Valck used the same decorative vignettes on three of his other double-hemisphere world maps. The map displays some interesting cartographic myths such as California as an island and a large Terre de Iesso. In addition, the northwestern coast of North America is largely blank and the Great Lakes are in early formation. The mythical lakes Lac Parime and Lac Xarayes are depicted in South America. A partial outline of the great southern continent, Terre Australe et Inconnue, still appears, and there are only partial outlines of Australia, New Zealand and Tasmania.